JAMES NORMAN ROBERTS Pilot Officer 124419 J.N.Roberts, Royal Air Force Volunteer Reserve died on 15 January 1943, aged 21. He was the son of Samuel Arthur and Margaret ("Rita") Sara Roberts, of Saxmundham, Suffolk. He is shown as 'buried' in the churchyard in the South West corner by the Commonwealth War Graves Commission. An announcement in a January 1943 newspaper stated that he was to be cremated at Golders Green Crematorium on Wednesday January 20, at 12:30 pm. His ashes were subsequently interred in Colwall churchyard on 2 September 1946. 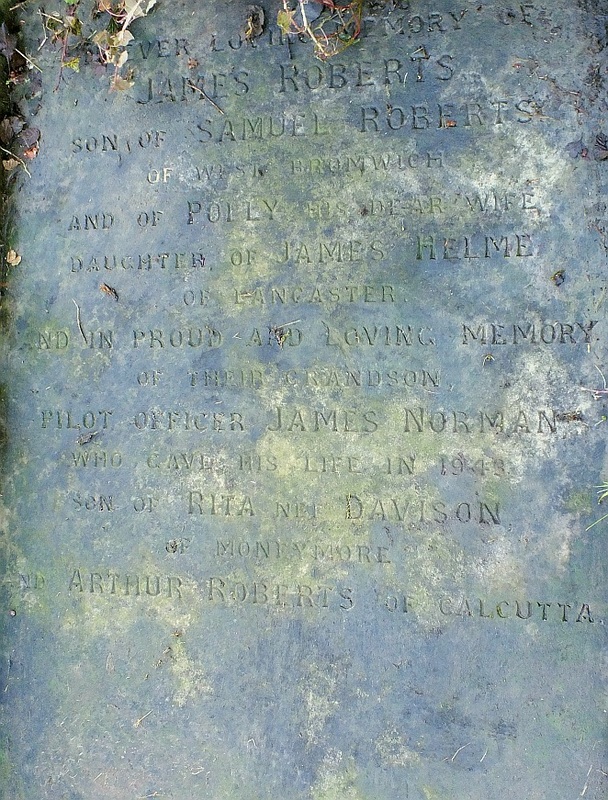 He is commemorated as follows on the horizontal gravestone of his grandparents "In ever loving memory of James Norman, son of Samuel Roberts of West Bromwich and of Polly his dear wife, daughter of James Helme of Lancaster and in proud and loving memory of their grandson Pilot Officer James Roberts, who gave his life in 1943, son of Rita, nee Davison of Montymore and Arthur Roberts of Calcutta".